These pipes are manufactured as per BIS standard and are available in deep blue colour. One end of the pipe is male threaded where as other end is female threaded socket. Threads are either V or trapezoid type and protection caps are provided on the threads to protect the threads in transit. Three types of pipes i.e. Shallow Well (C.S.) Medium Well (C.M.) and Deepwell (C.D.) 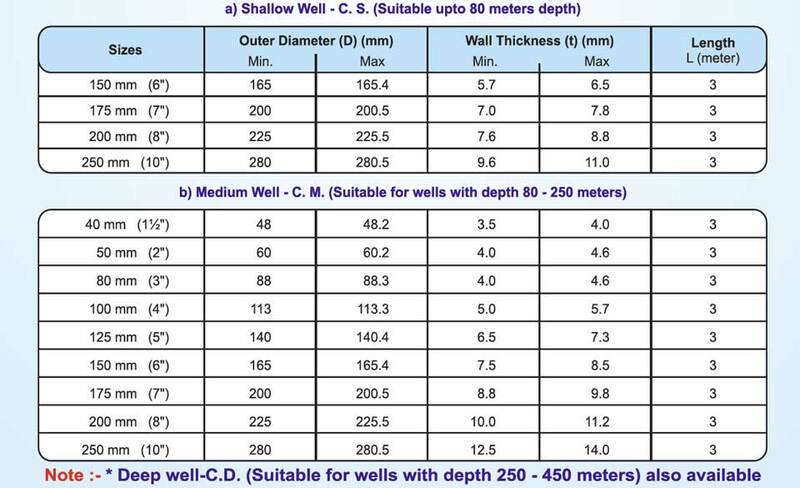 are available shallow well pipes can be used for depths upto 80 meters and Medium Well Pipes can be used upto 250 meters. Screen or slotted pipes are used for casing in ground water section to allow water to come inside the well. These pipes can also be used to provide soak-ways for the storm water/rain water to infiltrate back into surrounding ground thus we can harvest surface water, which is 80% of rain water, and recharge the ground water resource and avoid the wastage of rain water in the form of run off. These percolation pipes can also be used in roof top water harvesting in the form of percolation pit, to recharge ground water, percolation pit with borewell, and to percolate rainwater on the road side through isolated or connected percolation pits. To provide effective soakways for storm water infiltration. Effective way for recharging ground water. To improve groundwater levels and availability. Controlled and reduced volume discharge into existing main sewer systems and water courses.